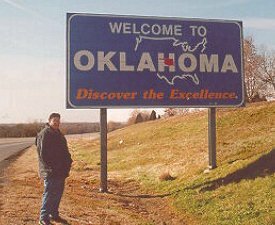 I entered Oklahoma on I-40 coming across the state line from Fort Smith, Arkansas. This sign is, I gather, a little old. Recently Oklahoma redesigned its license plates to include the slogan "Native America" in green with the symbol featured in the state flag: a peace pipe and an olive branch crossed on top of a buckskin and eagle-feather shield. The welcome sign that I saw along the Kansas border featured the same scheme as the license plate. It was much smaller than this, as it was along a two-lane road; signs on Interstate highways are almost always larger. It's quite an apt slogan, really: "Native America." Oklahoma is home to more American Indians than any other state, just over a quarter million (making them Oklahoma's largest ethnic minority). In fact, the name of the state comes from the Choctaw for "red people" ("okla humma"). 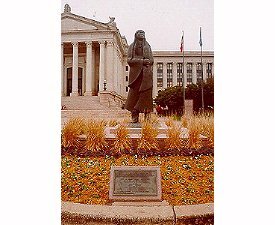 American Indians play a critical role in Oklahoma's history. Shortly after the Louisiana Purchase, war broke out between the Osage, Cherokee, and white settlers. The Osage ceded much of their land to the United States as part of the peace settlement. The Osage continued violence, and were forced to cede the rest of their land in 1825, whereupon they moved to the Kansas Territory. By 1870, the United States sold the Osage land and gave the money to the tribe. The government also formed a reservation in what is now Osage County. After the Indians moved onto the reservation, they struck oil, making the Osage the wealthiest people per capita in the country. Under the Removal Act of 1830, Indians from the southeast, including the Cherokee, Creek, Choctaw, Chickasaw, and Seminole, were forced to move to the Oklahoma Territory. Many died en route along what is now known as "The Trail of Tears." The Five Civilized Tribes, as they were known, were settled not on reservations, but as sovereign nations, a status they retained until Oklahoma became the 46th State in 1907. During the Civil War, tribes were divided between favoring the South and neutrality. Confederate troops attacked neutral tribes, many of which fled to Kansas. After the war, Congress seized some of the western Indian territories and used the land to create new reservations for tribes such as the Kiowa and Comanche. Oklahoma has, I think, more toll roads than any state this side of New Jersey. And a bizarre toll system at that, too. Take, for instance, my trip on the Will Rogers Turnpike in the northeast part of the state. I got on the pike at Vinita, right before the World's Largest McDonald's, where I went through a tollbooth and got a ticket. About two miles down I-44 was another tollbooth. The collector said the toll was $3.00. I showed her my ticket, and I only had to pay $1.50, for which she gave me a receipt. If I had gotten off at either of the next two exits, I would have given the collector at that tollbooth the receipt I got from the other one, and the collector at that one would have given me a refund. Got that? Good. Me neither. They're not all bad, though. For a dollar I got to drive on the Muskogee Turnpike. At 75 miles per hour, I've not driven on a road with a higher speed limit. They also have a lot of interesting signs. Like this one: "DON'T DRIVE THROUGH SMOKE." On Tuesday, December 5, 2000, at 4:23 PM Central Standard Time, I was driving westbound on Interstate 44 at milepost 237.3 in Tulsa, Oklahoma, at approximately 73 miles per hour while the Doors' "Love Me Two Times" played on the stereo. It was there that my trusty 1993 Ford Explorer (with Michelins, thank you) hit 100,000 miles. 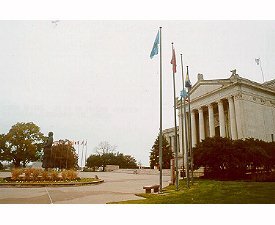 Oklahoma's State Capitol is outside of downtown, about a mile and a half north-northeast of the Oklahoma City National Memorial. The north and southbound lanes of Lincoln Blvd. divide and then straddle the Capitol grounds, and 23rd street passes underneath. This is one of the most interesting Capitol grounds that I have yet visited. When I was there, I thought that it seemed like a dome was missing. Behind the north and south porticos, in the geographic center of the statehouse, you can see the vestiges of a sort of pedestal or platform or foundation for where a dome might go. Apparently, I wasn't the only one who thought this. 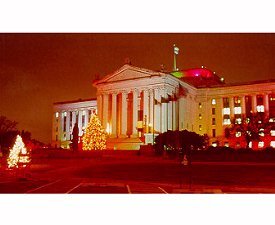 As I was preparing this page and looking up the URL for the "Official Oklahoma State Capitol Page" link below, I saw that Governor Keating announced plans to construct a dome for the Oklahoma State Capitol. "Some Oklahomans may not be aware that the original architectural plans for the State Capitol included a dome," the Governor said, "so, in essence, our Capitol is unfinished." Construction will begin in April and the dome is expected to be completed in November 2002, at a cost of about $20 million; more than 75% of which has been donated from private sources. But that's not the only intriguing feature of this Capitol. By the south front stand 12 flagpoles; one for each of the 12 flags that have flown over Oklahoma in its history, including the Louisiana-Purchase-era French fleur-de-lis. 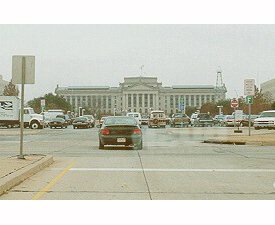 The Oklahoma Capitol is the only statehouse in the country that has oil wells on the grounds. They represent Oklahoma's petroleum industry. Well, "represent" isn't the right way to put it. More like, "are part of." See, they are real and they are fully operational. 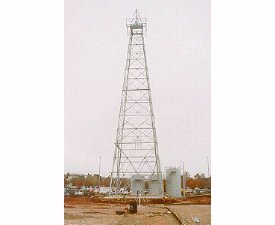 They're not there for decoration; they're there for drilling oil. To the north of the Capitol is the Meeting Place. It is a hemispheric stone sculpture with walkways carved into the compass points. In the middle is a large piece of granite. 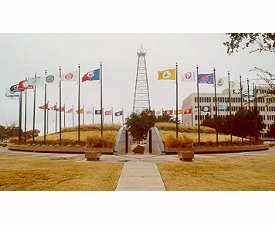 Surrounding it are the flags of all of Oklahoma's Indian tribes. 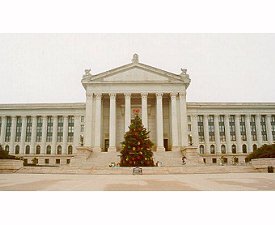 Note: On November 16, 2002, the State of Oklahoma dedicated its new capitol dome. 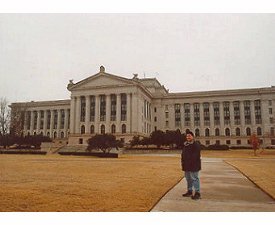 The Oklahoma State Capitol, built in 1917, was unique in that it was the only state capitol designed to have a dome that, until 2002, was never built. This page loaded in 1.882 milliseconds.